Thank you for the amazing 2018 season! We’re looking forward to see you again next summer. Climb aboard our super-fun Honda Giorno 50cc scooters! Cruise the back roads, climb up to view points or traverse the entire Whistler Valley. Rentals are available by the hour and 2-seater options (Yamaha BWS, 125cc) are available if a guest is not confident enough to drive. A full drivers license is required and please note that scooters are not permitted on the valley trail. 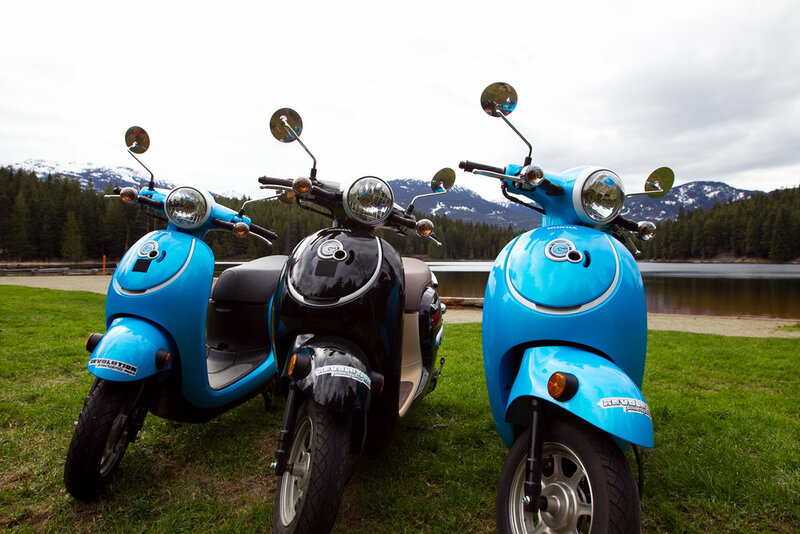 Spitfire is the only company in Whistler to offer motorized scooter rentals so book yours today! Sometimes all you need get around is a regular pedal bicycle. Our selection of urban comfort and cruiser bikes come in a range of sizes and are equipped with comfortable saddles and easy gearing. We also have kids bikes, chariots and tandems for all your self-propelled needs. Cruise the Whistler Valley Trail with us!